The two-port configuration allows the actual sound pressure in the coupler to be monitored by a reference microphone simultaneously with the microphone under test. The built-in DC-coupled power amplifier enables the calibration to be used for swept-sine, broadband and step function investigations. 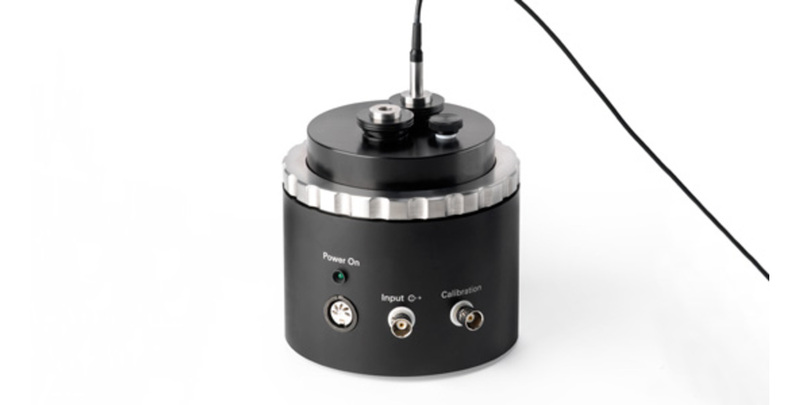 The calibrator can be used for both rear-vented and side-vented microphones. In the case of rear-vented microphones, the 42AE can seal the microphone from the preamplifier to obtain the response of the microphone independent of other leaks. The calibration of microphones in the frequency range below 50 Hz requires a special apparatus that exposes the complete microphone to the pressure variations of the calibration signal, and not just the microphone diaphragm alone. The air equalization system of a microphone is important for determining the low-frequency response, together with the amplifier of the electronic system. Air equalization must be fast enough to compensate for changes in altitude and barometric conditions, and slow enough not to affect the response of the microphone at the lowest frequencies. Most measurement microphones will be adjusted to a lower limiting frequency of 1 – 3 Hz. But 0.1 Hz is not unusual for infra-sound measurements as well as for airbag testing. Around the body of the 42AE, which houses the coupler and all its pre-assembled contents, are input and output sockets as well as a green LED. The accessories included with the 42AE are, more or less, common to all measurements setups. The manual describes a series of configurations and measurement setups and specifies in detail what items are required in each case. The dual channel Power Module 12AR is recommended because it can be used at frequencies down to 0.05 Hz.